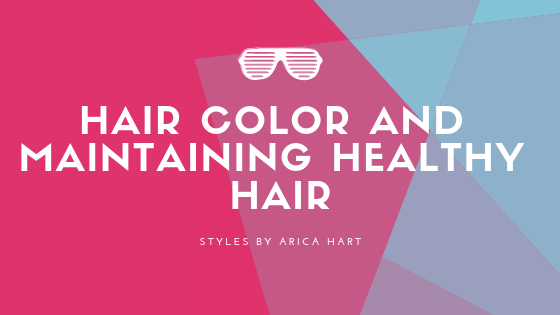 Color can be very intriguing and beautiful if you maintain the proper hair care routine . It can make you strut down the road thinking you are the woman in charge of everything. Yes, honey flaunt your tresses and rock your style to the best of your ability. You usually have to maintain your hair color by getting it reapplied about every 6-8 weeks depending on how fast your hair grows out and the look you are looking to achieve. Highlights are the easiest type of color to maintain, because the roots don't look as bad when they grow out. Always remember, you may not be able to get your desired tone on the first try. If you are trying to lighten your hair 3-4 shades, you may want to do it as a process over-time to help keep your tresses healthy. It may take a few color applications! I'm not saying it can't be done in one process, but if you want the hair to stay on your head and be healthy, it may take your stylist a few stages. Big changes can damage the hair; meanwhile, being patient can help a person have beautiful, healthy hair . Everybody's hair is not the same. Just because someone is able to get a particular hair color in one process, doesn't mean you can. After all, their natural color may already be lighter than your hair. There is not as much color need to be lifted as with the other person. Another factor is they may have healthier hair than you. The point is when dealing with color, it's a case by case situation. To help preserve your hair color, you may use a shampoo for color treated hair. Keep the hair conditioned good. Avoid using heat appliances to often . When using heat appliance use a curling wax or some sort of heat protector.